After unseasonably cool temperatures this week (high Wednesday was only 68 degrees! ), we are now in the throws of a typical Midwest Summer: hazy, humid, and triple-digit heat index all week long. I really can’t complain though… it offers me the excuse to remain inside and read and write. I am continuing my middle grade reading marathon and must admit I’m thoroughly enjoying this genre. While I prefer to teach higher grades, indulging in academic discussions which feature a variety of personal opinions, I find middle grade novels better suit my writing style. These books engage in relevant and sometimes difficult topics, but without the graphic violence, unnecessary vulgarities, or sexual romance that I don’t feel comfortable writing myself. The premise attracted my attention: a 12-year-old girl moves to Paris with her family and discovers a mysterious cabinet that promises immortality. I enjoyed the author’s writing style, and the descriptions of Paris of course kept me entertained. However, there was simply too much focus on science and alchemy in this magical world to hold my attention. I am surprised at the relevancy of this book, since was written in 1968. However, human nature – and teenagers – remain the same. There are a few outdated references, but I can honestly say I don’t remember the last time I read a book where I became so enamored with the lives of the characters. I was sad to say good-bye to these friends when the story ended. I adored how the story of Mr Pignati (the Pigman) was told in the alternating voices of John and Lorraine. A sweet story that somehow withstands the test of time. Written in 1944, this story would appeal more to upper elementary students (or as a read aloud to lower elementary) since the characters in the story are that age as well. I forgot how children quickly learn to tease others so they do not become the outsiders. Poor Wanda Petronski lives on the wrong side of town, has a difficult last name, and wears the same dress to school every day — many reasons to make her an easy target for mean girls’ criticism. While the end of the book is a bit pedantic (I prefer a more subtle moral of the story), it is most definitely a worthwhile read. I picked up this book because I so enjoyed Seven Stories Up. The author is a gifted writer, there is no doubt about that. And I am sure this story would have great appeal to its intended audience. For me there was a bit too much suspension of belief with regards to the magic bread box, but the storyline was delightful and I could certainly relate to Rebekah’s emotions after her parents’ separation. This brings my annual MG reading total to about 25 books (!) At this point I think I am ready to start writing brief Book Impressions for the blog as well as GoodReads. I hope to write one impression a week, with the hopes of catching up by the end of the year. I have continued with my French Friday posts. 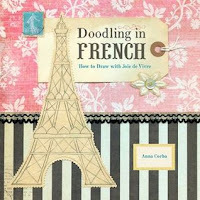 This week I reviewed the book Doodling in French (and even offered photos of my own feeble attempts). I also began to chronicle my recent trip to Italy by posting a photo of the Gondolas of Venice for the Wordless Wednesday meme. I am also listening to the podcast, 31 Days to Building a Better Blog, by ProBlogger.com. I am trying to walk on the treadmill at least 25 minutes a day (ugh…) so watching movies on Netflix or listening to an engaging podcast helps the time past. I would recommend this informative challenge for anyone who is interested in improving their blog site. I tried numerous times to begin the revision process of First Impressionism (my MG historical fiction novel) but discovered writing a novel is completely different from writing academic essays. When I write an essay or article, I tend to mull and ponder for days prior to putting pen to paper. Because of this, my first draft tends to be fairly polished. Of course it needs revision, but more in terms of tweaking rather than major overhauls. A novel, however, has so many different components to evaluate: plot structure, character arc, consistent voice, theme development, natural dialogue… the list goes on and one. Every time I start to revise a single chapter, I am overwhelmed by all the considerations. Fortunately Writer’s Digest arrived in the mail mid-week and this month’s focus is Revision. I glanced through the table of contents and read this description of an article: The Great Revision Pyramid: Improving your novel draft the frustration-free way, layer by layer. I immediately turned to page 28 and read the entire article, underlining practically every line. The author, Gabriela Pereira, developed the website DIY MFA, which promises a Do-It-Yourself Master of Fine Arts program. She even has a podcast which I will now listen to as I take those daily walks on the treadmill. I may not earn a diploma, but I am anxious to glean the knowledge. I am looking forward to another good week of reading, writing, and perhaps a bit of scrapbooking (I have a Christmas in July crop scheduled for Friday evening). I hope you find some time to pursue fun past-times as well. Oh my gosh, I adored The Pigman when I was young. It sounds like I should revisit it. Kathy – I am embarrassed how many middle grade classics I missed reading when I was that age. But I am learning the themes and characters are still relevant today. I would definitely encourage you to re-read Pigman… his relationship with Bo-Bo touched my heart. I remember hearing of the Pigman book when I was a kid, but I don't think I ever read it. Maybe I need to finally pick it up after all these years. All you had to do was ask…I adore middle grade fiction, and I'm all too ready to throw titles at you. (Please forgive me if you've already read these.) Here goes: Where the Red Fern Grows, Skellig, Little Women, Anne of Green Gables, The Lightning Thief, Voyage of the Dawn Treader, Regarding the Fountain, Harry Potter, A Year Down Yonder, Stuart Little, Lord of the Flies, I Am the Messenger, The Watsons Go to Birmingham, Black Beauty, Old Yeller, Number the Stars, The Giver, The Summer Book, Secret of the Andes, The Hero and the Crown, Firegirl, The 18th Emergency, Year of the Dog, The Adventures of Polly and the Wolf, Phantom Tollbooth, Incredible Journey, The Case of the One-Eyed Killer Stud Horse, The Midwife's Apprentice, The Red Pony, Tale of Despereaux, Half Magic, A Monster Calls, Lives of the Artists (and others by Kathleen Krull), Roll of Thunder Hear My Cry, Rules, Shiloh, The Adventures of Treehorn, By the Great Horn Spoon, A Long Way from Verona, Charlotte's Web, Five Children and It, Stargirl, Sounder, The Arrival, The Westing Game, A Christmas Memory, The Trumpeter of Krakow, Out of the Dust (! ), A Single Shard, Adam of the Road, Redwall, The Yearling, Violet Mackerel's Natural Habitat, and The Invention of Hugo Cabret. Oh Bryan – I encourage you to find a copy! It is a quick read, but leaves a lasting impression. Deb – SO much goodness in this comprehensive list. Thank you for taking the time to post it! What a great list! I'll definitely have to check out The Pigman, it sounds wonderful. Oh do, Monika! I'd be anxious to hear your thoughts. 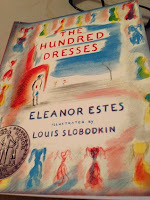 I LOVED "A Hundred Dresses" and was delighted when my daughter read it for school, gleaning as much about its important message as I had as a youngster. Also, thanks for mentioning the DIY MFA. I'm intrigued and the fact that Gabriela and I share a last name makes me even more interested! Sonia – let me know how you like DIY MFA … so far I am loving the podcasts! I am so glad you are finding joy in your genre! I too remember the Hundred Dresses! I adore middle grade books, whether classic or new.